Massive Entertainment, the developers behind Tom Clancy's The Division have their roots with the PC gaming audience, with their first games being the Ground Control and World in Conflict series, on PC. Since then the developers have worked and helped to provide solid PC ports like Far Cry 3 and several other titles, but now with the Division Massive promise something that is "more than [just] a port" on PC. The Division is one of Ubisoft's most highly anticipated titles of 2016, offering great visuals and and some exciting loot and shoot gameplay mechanics that players of Borderlands and Destiny will be very familiar with. On PC it is an understatement to say that we expect a lot with Massive at the helm, especially as this game will be the first to use Ubisoft's new SnowDrop Engine, an engine that Ubisoft said was designed with efficiency in mind. This makes us hopeful that we will see some great performance numbers in this game alongside its great visuals. With Ubisoft's recent reputation on PC being untrustworthy at best does The Division have what it takes to turn things around? For this game we will be using the newest drivers that were available when the game released, which is Nvidia's Game Ready Geforce 364.51 driver and AMD's 16.2.1 driver, both of which became available to the public in the past month. Im benching some results right now. I clearly see an issue with Gsync at the moment. Ill post some results when im done. Look at the FPS loss with Gsync turned on with SLI. 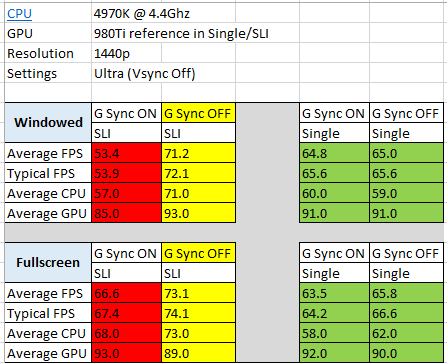 I thought SLI was fine until i started benching some results. I just kept it simple and consistent. Results are an average of 3 runs per variation. And this is with the new Nvidia drivers intended for The Division. Using a ROG Swift Monitor with refresh set at 120hz via Nvidia panel. Interesting was that when using windowed mode in game, it automatically locked refresh to 60hz as opposed to the 120hz set by default. Do you have actual 4k images uploaded anywhere I can view comparing the graphics settings? Either I'm missing something embarrassingly obvious or the images are far too small to actually compare. For whatever reason the 4K image links broke, but it it is fixed now.